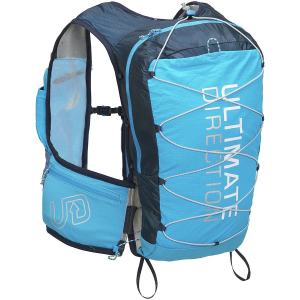 Stock the Ultimate Direction Mountain 4. 0 Hydration Vest with all the water, snacks, and extra layers you need for a full day of running up steep trails and traversing high alpine ridge lines. The vest's Comfort Cinch technology consists of two bungee cords that can be quickly pulled or loosened to adjust the fit of the vest for a snug, secure, and bounce-free fit. Throw a pair of water bottles in the two front pockets for convenient access to water while you run, and be sure to throw some emergency essentials in the two side pockets so you don't find yourself miles from the nearest trailhead without the necessary emergency equipment to get yourself out when things don't go as you'd planned.